3 Bedroom Villa with private pool Just 2 minutes away from high rise zone! A wonderful vacation villa at just 5 minutes walking distance from it all. Near to the boulevard with its restaurants, shopping area, cinema, all water sports activities at Palm Beach beach and high-rise hotels. Make yourself at home featuring a full equipped kitchen with dishwasher, refrigerator with water and ice dispenser, coffee maker, microwaves, toaster, TV with cable programming for your entertainment, private pool, jacuzzi, outside pool bar w/ grill, sunbeds, pool table, laundry room with washing machine and dryer. Additional complimentary wireless Internet access. The master bedroom has a king-size bed and the other two bedrooms has a queen-size bed. 2 bathrooms with showers and 1/2 bathroom without shower features complimentary toiletries. Convenience include safes and housekeeping is also provided twice a week. The villa gives you both the seclusion and privacy and is fenced for all your privacy and the are is very safe. We hope you can make it to One Happy Island and stay at our wonderful vacation villa. The bathrooms in the 2 bedrooms are tiled with European ceramics. Toilet paper, bathing soap and towels are provided. We loved our stay at the Villa. The location is very private and the outdoor pool area is fantastic. Plenty of space, and all the amenities you need for cooking and relaxing. The staff was attentive answering emails and the transport from the office took the time to show us around the villa and the surrounding area. The walk to the beach is maybe 5-7 minutes and there are food options near by, not including the hotels on the strip. Some general suggestions, check out the Old Cunucu house. Authentic food and really close by. Stop by the Super Foods and stock up on groceries and/or alcohol. The villa is has a fully equipped kitchen and grille and the Super foods is the best grocery store on the island. You will need to drive or cab there. This was the second time we rented this villa. The first time was 3 years ago and we could't wait to come back. The villa is located in a quite neighborhood just a short walk from the shops, restaurants, and the beach. The walk to the beach is safe and took us about 8 - 10 min with 2 small kids. We always used the Raddison's beach and never had any problems. Countless restaurants are within a 5 min walk. The villa itself is fully equipped with everything you need. If something isn't there, just call Lucy and she will take great care of you. The place is also very specious. The kitchen is large and there is a nice size dining table for 6. The best part of the villa is the pool. The water is crystal blue and the gardens are very well maintained. We searched several villas for our second trip. However, the location and the appearance of this villa and the pool were no match to the other properties. Wonderful vacation spot on beautiful Aruba! This was our ninth visit to Aruba, but our first time renting a villa. We would definitely rent this villa again! Quiet (except for the crowing rooster, but even that wasn't too bad), clean, close to great restaurants and grocery stores. You should rent a car to explore the island and all of the beautiful beaches. The pool on site is well maintained and clean. John, the pool man, is very pleasant and made our stay that much more enjoyable. What a great guy! Any questions or concerns we had about the villa during our stay were answered pleasantly by Lucy from the management office ( an easy phone call away). The housekeeper did a fabulous job keeping the property clean for us. We would recommend this villa to anyone wanting to get away from the noise and crowds at the hotels. 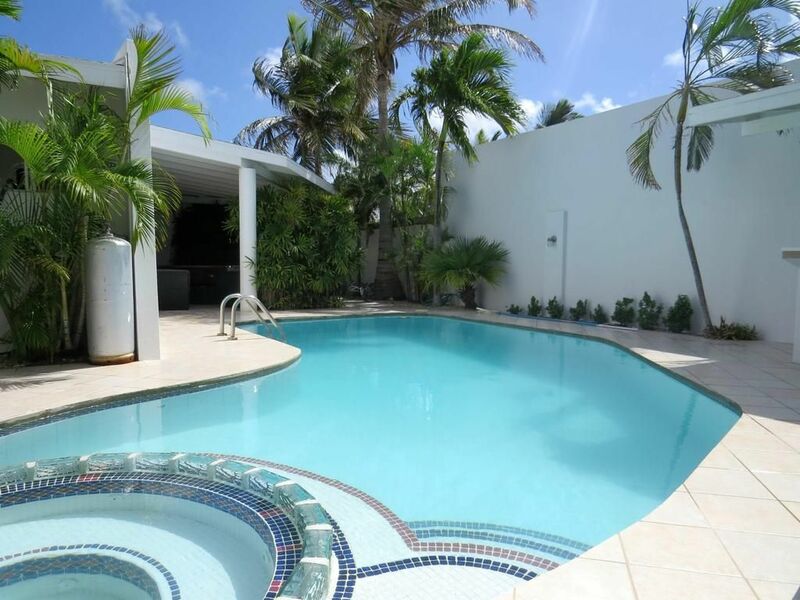 The house is very nice and is located 10 minutes walk to palm bech. A lot of nice restaurants within walking distance. The house is very clean and have all the things you needed. Thanks Natalie for doing a fantastic job! However the swimming pool service was a joke. Since it is blowing a lot many leaves and smaller branches end up in the pool. A net provided for us to clean the pool had been great. Now it was so dirty in the pool sometimes that you did not wanted to use it. The food store that had everything you need for cooking was 10 minutes away with car. We had a fantastic three weeks in the house and we liked it very much despite of the pool issue. The house manager was very responsive and served us well. Great Stay @ Palm Beach Villa! We just returned from a lovely 1 week stay at this house. We were 5 adults and 1 toddler and the house's size and amenties worked perfectly for us. The house was clean and well maintained. Everything was as noted in this listing, no dissappointments. I should note that the house does not come with an oven, this was not a problem for us as the BBQ was top notch, however I do feel I should note it. We got great use of the lovely pool day and night. We loved the bar and sink outside, we ate almost all of our meals out there. The outdoor pool table was used several times by our male occupants - the loved it. Our daughter had great fun with the inflatable pool toys provided. We even managed to take advantage of a fallen coconut from of one of the many trees on the property and made wonderful coconut margaritas in the blender provided - simply fabulous! Giovanni was very friendly, greeting us upon arrival for house orientation. He was both prompt and attentive with all of our requests during our stay. Both the house and the pool were cleaned while we were there (actually the pool was cleaned twice). The only drawback is that there are several local dogs in the area and they tend to bark quite loudly at night and very early in the morning. In addition, a rental car was very helpful for us with this house, it is a bit of a trek to the beach. It is doable for adults, but not for kids. We can't wait to return for another stay next year! The Villa is locates at just 500 meters from the beautiful white powdered sand beach, Palmbeach, with its crystal clear water and within walking distance from the boulevard with fine restaurants, shopping malls, cinema and many activities like watersport, night clubs and casino's in the hotels and local folklore shows.